Conversations Magazine: BOOK REVIEW: LETTERS TO A MIXED RACE SON by Frank E. Robinson, Jr.
BOOK REVIEW: LETTERS TO A MIXED RACE SON by Frank E. Robinson, Jr. In a world that continues to grapple with notions of race, a loving father writes a series of letters that speak into the life of his biracial son. 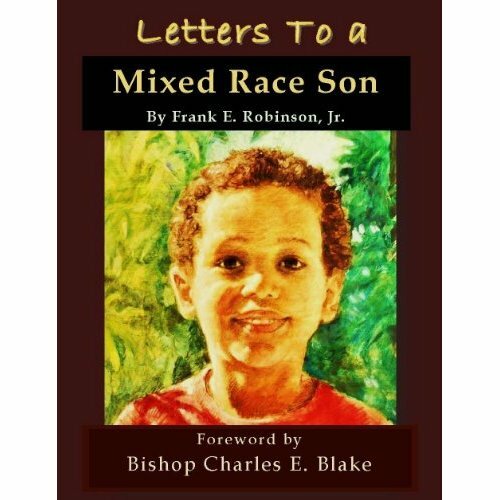 In the book’s foreword, Bishop Charles Blake introduces us to Frank Robinson and these Letters To a Mixed Race Son. In 1984, Frank Robinson was a young minister serving in southern Alabama, when word got out that he was engaged. It would be an interracial marriage, which quickly became a local controversy, both scandalous and dangerous. This marriage was announced not long after a lynching in one of the neighboring areas. For safety, their first child was born across the state line. Frank began to understand that if he did not survive, his wife would be left a widow and his son without a father. With this in mind, he began to write letters that would survive in a book. He intended to say the things a father should say and to equip his son to live a meaningful life. Further, even when this son was so young, the letters were written as to a man, so that when the boy became a man, he could have this book. This father writes about identity, character and the timeless responsibility of men and fathers. He speaks of courage as one faces life, hardship and injustice. He tells his son of perseverance, humility and faith, of how to deal with disappointment, criticism, and so much more. These letters were written over years and through seasons of difficulty. The author reminds his son to never forget what struggle is like. This book tells of a unique and interesting journey. The mixed race son has grown up, is now married, a new father and a military officer, who serves his country during a time of war. In 2011, about twenty five years after the project started, Frank Robinson gave the hand written original book of letters to his son, who has already begun to write letters to his own child. The author has read a few of these letters to some scarred and damaged people. He found the words he wrote to his own son, were medicating to the sons and daughters of others. Further, these letters may help the reader to see the world a little differently and possibly to find a better self. This work is heartfelt, moving and refreshing, ultimately a rich, deep and encouraging piece of literature. LETTERS TO A MIXED RACE SON is available on Amazon.com. There are so many things in the world that seem to separate us. For many race is the one thing that makes us different, but in Frank E. Robinson, Jr.'s book LETTERS TO A MIXED RACE SON we are able to glean the importance of who we are instead of what we look like. In a series of letters to his son that span over a decade, we are able to read how the father shares not only his thoughts about his son but the lessons he has learned along the way. Robinson's faith leads us to remind his son of the importance of being authentic and true to himself and respecting all life. There are personal areas of the book where we see how the father deal with challenges in his home, but writes that he tries his best to shield his son from the worries that sometime cloud the household. We are also able to see how the father is able to share God's word with his son in a way that is practical and not preachy or condemning. One of my favorite lessons comes in a letter dated July 18, 1990. Robinson writes this: "A good name...is worth protecting. I am what God has called me to be. I am who He has made me to be and I have what He has given to me. My definition involves Him. Another person's labeling of you or me may or may not be accurate. So what? I know who I am." That is something all of us can take away from this heartwarming account. It is the heart and all that comes from it that matters. That is what we should focus on, and in the end that is what will sustain us through the difficulties that we face. No matter where you're from or what you look like, Frank Robinson, Jr.'s LETTERS TO A MIXED RACE SON helps us better understand our own place in the world---and we are better off because of it.